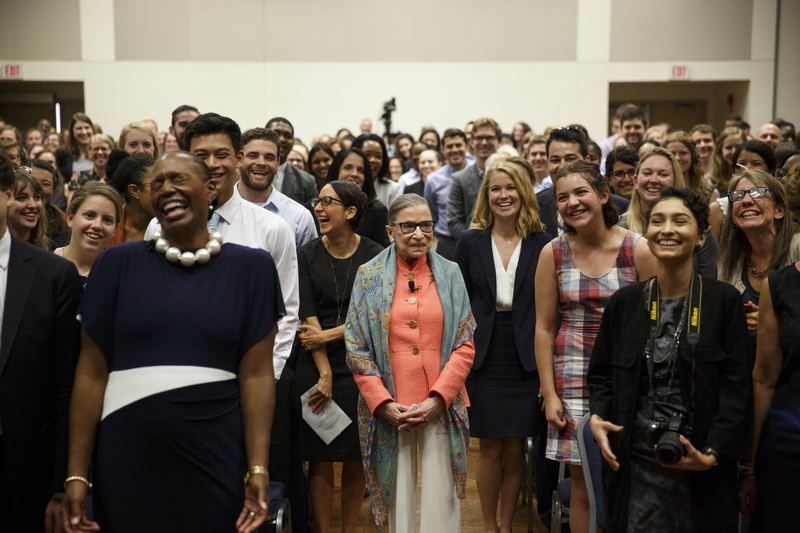 Supreme Court Justice Ruth Bader Ginsburg visited the George Washington University Monday as keynote speaker of the Washington Council of Lawyers’ Summer Pro Bono and Public Interest Forum. “I can say that in my life as a lawyer I gained greater satisfaction from things I wasn’t paid to do than what I got a paycheck for,” Ginsburg told an audience largely composed of law students and young lawyers. In conversation with Nicole Austin-Hillery, director and council of the Brennan Center for Justice, the longest-serving female Supreme Court justice discussed her pioneering judicial career, her advocacy work, and the slow but steady advance of equality for women and members of minority groups. Only recently, Ginsburg reminded the audience, has the white male homogeneity of the judiciary and legal professions begun to alter. When she entered law school at Rutgers, Ginsburg’s class of over 500 students contained only nine women and just one African-American. Only one woman had ever sat on a federal appellate court at that time: Florence Allen, appointed in 1934. After Allen’s retirement in 1959, the appellate bench would remain entirely male until 1968. But her college years coincided with Sen. Joseph McCarthy’s persecution of artists and intellectuals for perceived Communist ties. A professor helped Ginsburg see that she might have important work to do defending civil liberties. “He pointed out to me that there were lawyers standing up for these people and reminding members of our Congress that we have a First Amendment that says we have the right to think speak and write as we believe, and not as big brother government tells us is the right way to think, speak and write,” she said. Civil rights remained Ginsburg’s focus, and she eventually became general counsel for the American Civil Liberties Union before being appointed to the federal bench in 1980. Though Ginsburg discussed benchmark cases in which she dissented, like Bush v. Gore—“an exercise in endurance for everyone on the court”—and Ledbetter v. Goodyear, she said it is rare for individual cases to catalyze progress. Like mentor Thurgood Marshall, Ginsburg believes in a model of “nudging along” social change. Individual cases, she said, are more likely to serve as “building blocks” than as trails blazed toward progress. For instance, though Brown v. Board of Education is often cited as the nominal end of segregation in America in 1954, Ginsburg believes it was not until Loving v. Virginia, in 1967, that the Brown became meaningful. “We still had apartheid in America—law-enforced separation of the races—until the miscegenation laws were declared unconstitutional,” Ginsburg said. Ginsburg emphasized the importance of the Constitution as an evolving document, alluding to Justice Marshall’s expressed belief that the Constitution he celebrated was not the document enacted in 1787 but what it became over subsequent decades and centuries. Asked what she might alter if she could take a magic wand to the Constitution, Ginsburg smiled: “That’s easy.” A staunch and open proponent of the Equal Rights Amendment, she rejected the argument that equality between the sexes is already guaranteed by the Equal Protection Clause. “When I show the Constitution to my three granddaughters, I would like to be able to point to the notion that men and women are citizens of equal status as a basic premise of our society,” she said. But while there are still battles to be fought, Ginsburg said, she has seen significant progress in representation for women and minorities. Supreme Court justice discusses gender equality, immigrants’ rights and freedom of speech at George Washington University.